Today I’m going to take a hard look at the recent bill for GMO labeling in Illinois. This follows the theme set by my previous post on the subject of biotechnology. I’ll be quoting the bill in italics. Formatting may be a bit odd as the source does not use text wrapping. informed about the products they purchase and consume. This section is a bit odd. Generally speaking, food labeling is supposed to serve a useful purpose. The term “produced with genetic engineering” tells us nothing about the trait used, what the trait does, etc. Furthermore, as these foods are both just as safe as (and sometimes safer than in the case of Bt) conventional food, there is no reason to distinguish them based merely on the general technology used to create them. It’s like demanding a label that says “produced with hybridization”. This is an exceedingly poor justification for mandatory labeling of genetically engineered foods. Genetic engineering is a technique for modifying the organism. This label would tell consumers very little about their food. Speaking in theoretical terms, this could mean anything from the product being resistant to a herbicide to the product being fortified with vitamins by itself. Furthermore, it is already possible for consumers to obtain non-genetically-engineered foods. Any product with the USDA Organic label cannot contain genetically engineered food, and the independent Non GMO Project certifies products as GM-free. Thus not only does the consumer already have an easy way of accessing foods that meet any possible personal preference, the existing process is completely voluntary and has resulted in a wide variety of products being sold that meet these requirements. Labeling the products that do not comply makes little sense, and making that labeling mandatory has no reasonable justification. and how to label foods produced with genetic engineering. This is a logical fallacy called argumentum ad populum. Argumentum ad populum is an appeal to the people/masses, where a proposition is said to be true because many or most people believe in it. In reality, the countries that have labeling laws do so mostly for political reasons, not safety reasons. As evidenced by the widespread bans against homosexual activity in many nations, popularity is not a good indicator of right or wrong. decide what information to provide to the agency. The first claim (that the FDA does not conduct safety studies) is indeed true. However, the second is a misrepresentation of the truth. Responsibility for the safety and testing of genetically engineered foods is split between three federal agencies: The U.S. Department of Agriculture’s Animal AND Plant Health Inspection Service (APHIS), the U.S.Environmental Protection Agency (EPA), AND the Department OF Health AND Human Services Food and Drug Administration(FDA). Biotech companies are required to provide any safety studies that the FDA demands, done at the company’s expense, and they are required to turn over the raw data to the FDA for review. The process is lengthy and complicated. The above USDA FAQ has some very useful information about the approval process. Biofortified did an excellent job refuting this point in their Analysis of Washington’s I-522 bill, so I’m just going to repost it here. All credit for the following two paragraphs goes to Biology Fortified, Inc and Bill Price. The “right to know” has been a debatable topic in GE labeling, dependent on perceived costs, benefits and risks. The implication here, however, is that consumers have this right because the process of genetic modification is dangerous and uncontrollable. All crop breeding techniques, including those used prior to GE, can lead to unintended results. Relative to these traditional crop breeding techniques, however, GE methods are more precise and controlled. Genetic engineering processes are very specific in the changes made, typically involving only one or two genes. [EDIT 3/19/2-13: Methods are now poised to become even more precise.] Because specific genes are targeted, the functional changes are anticipated ahead of time. Traditional techniques, however, may use processes such as outcrossing of varieties or mutagenesis through irradiation and chemicals. These methods induce simultaneous multiple changes in the genetic structure that are random in nature with unknown and unpredictable outcomes. Traditional breeding programs on crop plants such as potato, celery and kiwi, for example, have resulted in unintended and harmful effects in the past. [Edit 3/21/2013: New crops are regularly introduced to new markets with out testing and with unknown consequences. See the cucamelon, for example]. Admittedly, GE methodologies, like all breeding methods, may occasionally produce undesirable traits, however, they are unlikely to reach the marketplace because they are heavily scrutinized and tested for adverse effects prior to release. [Edit 3/23/2013: Kevin Folta has a nice comparison of plant improvement methods and their characteristics]. The mixing of plant, animal or viral/bacterial genes is actually quite common in nature. The complete genome of a bacterium (Wolbachia), for example, has been found nested within the chromosomes of the common fruit fly, drosophila. Viral components (endogenous retroviruses or ERVs) are commonly found in many vertebrates and can encompass a large proportion of their genetic code. Pea aphids have been shown to have acquired fungal genes for coloration. Snake genomic features have also been recently observed in cattle. Such examples of horizontal transfer of genetic material across phylogenetic categories are numerous and considered by some to be an important mechanism in the natural process of evolution. There is no reason to expect or suspect that this process would necessarily create adverse health or environmental consequences more than any other type of genetic transfer processes. toxicants or allergens with consequent health concerns. There is no proof that this has ever or will ever occur unintentionally. A study in the Journal of Experimental Botany investigated genetically modified soybeans and food allergies. It found that “Current GM crops, including soybean, have not been shown to add any additional allergenic risk beyond the intrinsic risks already present”, and additionally recognized that “Biotechnology can be used to characterize and eliminate allergens naturally present in crops”. A 2005 study on the allergenicity of transgenic maize and soya found that “None of the individuals undergoing tests reacted differentially to the transgenic and nontransgenic samples under study. None of the volunteers tested presented detectable IgE antibodies against pure transgenic proteins”. Another 2007 study on the allergenicity of transgenic soybeans compared to non-transgenic soybeans found that “Soybean endogenous allergen expression does not seem to be altered after genetic modification”. This evidence suggests that current transgenic food does NOT increase levels of allergens. But what about the toxicants? A 2012 review of 12 long-term studies (up to 2 years in duration) and 12 multigenerational studies (from 2 to 5 generations) found that “Results from all the 24 studies do not suggest any health hazards and, in general, there were no statistically significant differences within parameters observed”. There are a huge amount of studies on these foods. Let’s take a look at a few more of them to evaluate the claims of toxicant danger. This 2005 study on MON863 Bt corn found that “Overall, performance was not negatively affected in the corn residue grazing or feedlot experiments, suggesting the corn rootworm-protected hybrid (event MON 863) is similar to conventional, nontransgenic corn grain and residues when utilized by beef cattle”. This 2003 study on MON863 (Bt) and MON810 (Bt) + MON863 (Bt) in broilers. They concluded that “Broilers overall performed consistently and had similar carcass yields and meat compositions when fed diets containing MON863 corn or MON810 x MON863 corn as compared with their respective nontransgenic control and commercial diets, supporting a conclusion of similar feeding values among diets”. This 2006 study on MON810 (Bt) corn in rats concluded that “Overall health, body weight, food consumption, clinical pathology parameters (hematology, blood chemistry, urinalysis), organ weights, and gross and microscopic appearance of tissues were comparable between groups fed diets containing MON 810 and conventional corn varieties”. This 2005 study on Bt176 (Bt) corn and quails over ten generations found that “Feeding of diets containing genetically-modified corn did not significantly influence health and performance of quails nor did it affect DNA-transfer and quality of meat and eggs of quails compared with the isogenic counterpart”. This 2003 study on Bt11 (Bt) corn in broilers concluded that “It was clear that the transgenic corn had no deleterious or unintended effects on production traits of broiler chickens in this study”. Ironically, Bt actually reduces the amount of toxins present by reducing insect damage, which in turn reduces the amount of mycotoxins in said Bt corn. This paper estimates that Bt corn’s reduction of the mycotoxins fumonisin and aflatoxin in the US provides a benefit of 23 million dollars annually. Still not convinced? Scientific American has an informative blog post on allergens in genetically engineered food. You can view it at http://blogs.scientificamerican.com/guest-blog/2013/05/30/allergic-to-science-proteins-and-allergens-in-our-genetically-engineered-food/. I can say the exact same thing about hybrid foods, but that isn’t justification to label them. How about mutated plants? Those have a fairly high likelihood of producing unwanted effects, but I haven’t seen anyone attempt to have those labeled! unknowingly violate their dietary and religious beliefs. Without mandatory disclosure, vegans may unknowingly consume meat. This is why vegans buy vegan food, and why consumers who do not wish to purchase GE food should purchase organic or non-GM certified food. This law would actually fail to address this concern. Let’s say I’m morally opposed to consuming anything with fish proteins in it. And let’s pretend that one of the biotech corps finally found a useful gene from a fish (the tomatoes weren’t very useful), and put it in a product (let’s use corn as an example), then brought it to market. If I wanted to avoid that product (corn), if SB1666 had passed, I’d have to do exactly the same thing as if SB1666 hadn’t passed — avoid all corn that is labeled as genetically modified. SB1666 would at best give me a very small variety of corn that’s not organic and also not genetically engineered. The benefit to the consumer is minimal in that the label “genetically engineered” tells me absolutely nothing useful about the product. (11) Organic food sales are increasing. While total U.S.
farming. Organic farmers are prohibited from using GE seeds. growth of the organic market. Destroying the biotech market to support an inefficient food production method hardly seems like a smart move to make. Genetic drift is a normal part of farming. If you want your corn to be completely pure, grow it in an isolated greenhouse, or use proper spacing between your fields and your biotech-corn-growing neighbors. of foods claimed not to be the product of genetic engineering. Err, what happened to USDA Organic and the Non GMO Project? I’d quite certainly consider those to be consistent standards! And how exactly is it more efficient to label all genetically engineered foods instead of just labeling all non genetically engineered foods? Did someone go rewrite the laws of physics? Andrew Kniss, Assistant Professor, Weed Biology & Ecology at the University of Wyoming, ruthlessly tore apart Benbrook’s work over at his blog. I’ll summarize his findings here. 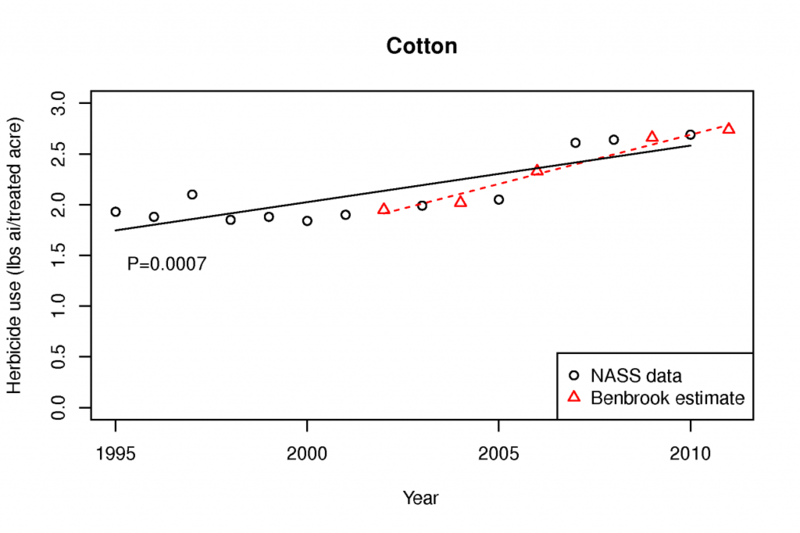 Basically, Benbrook did not have NASS data for cotton in the years 2002, 2004, 2006, 2009, and 2011; for soybeans he had nothing past 2006; and for corn he had nothing for the years 2004, 2006, 2007, 2008, 2009, or 2011. Instead of contacting private companies that track this sort of data and purchasing their data, he decided to “forecast” the data for these years. To his credit, his data for cotton appears to be fairly accurate, as you can see below. 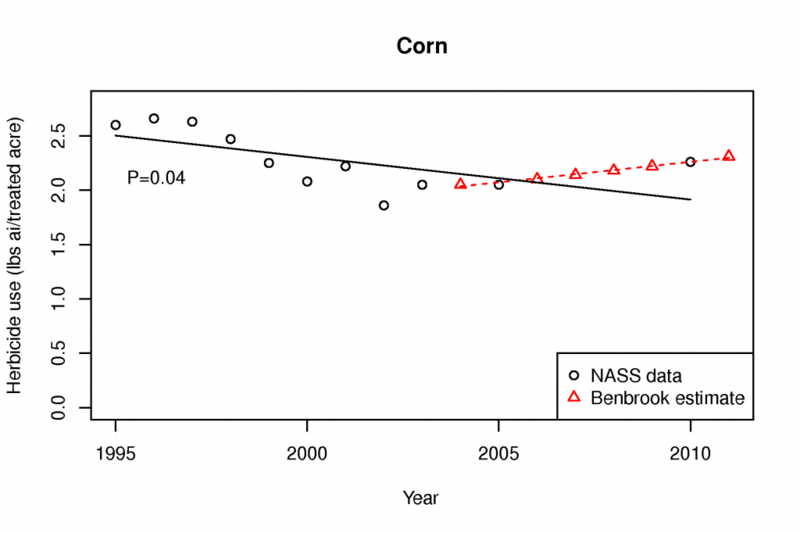 For corn, Benbrook estimates that herbicide use is increasing, despite the data showing a decline. 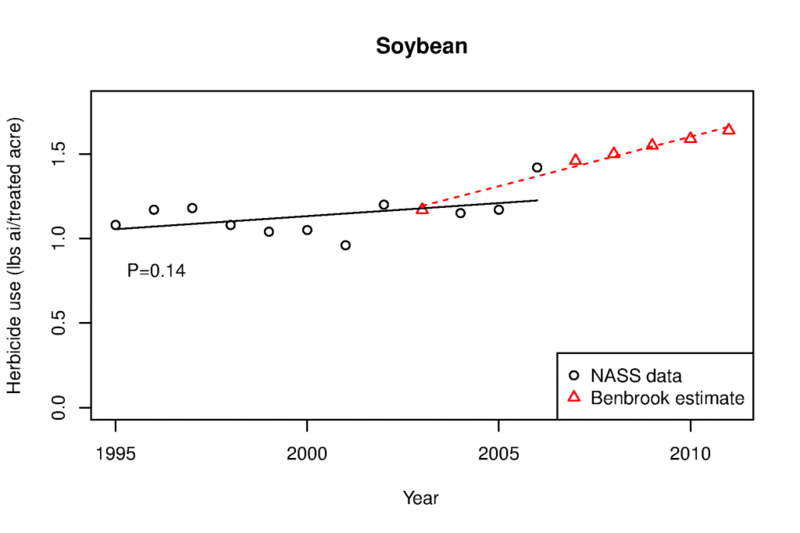 Last but definitely not least is the soybean data, where Benbrook forecasted five years of data based on only 11 years of observed data. I’ll let the graph speak for itself. But Kniss’s investigation is by no means the only one. Anastasia Bodnar criticized his previous 2009 study (almost identical to his 2012 one) for Biofortified, and found some rather interesting things. Benbrook failed to distinguish between herbicide tolerant and insect resistant plants, lumping them together under the generalized and highly misleading label of “GE Crops”. Benbrook also used the term GE crops multiple times when he should have referred to herbicide resistant crops. Benbrook also completely ignored the relative environmental toxicity of glyphosate, which is far lower than many alternatives. Benbrook also ignored the non-biotech herbicide resistant crops, despite how they’re just as relevant to herbicide use with resistant crops. PG Economics also released a report on the study, where the study was criticized for a variety of reasons, including for overstating herbicide use by 63.4 million pounds (not exactly a small error!). Further criticisms included the failure to acknowledge environmental benefits from the herbicide resistant crops, a weak approach, and the already mentioned misleading use of NASS usage data. Last but definitely not least, claiming an increase of pounds without reporting the changing market share of herbicide resistant crops is extremely misleading. …yet this report just endorsed organic farming, which isn’t exactly good for the environment. If you want an environmental impact label, make a bill for an environmental impact label. This is very disappointing. This label is not informative. There is no information about the specific trait, and the label is not located in the ingredients list (where it would belong), but instead it has to be displayed on the main packaging. Remind me, how exactly does this inform consumers? Or is this entire bill just a carefully-concealed attempt to drive sales towards the organic industry? This bill is disappointing. Contact your representative(s) and tell them to vote NO on SB1666.